An investigation is underway into an early morning traffic accident that left a pregnant teenager dead in the South Bay. The two-car collision on southbound U.S. Highway 101 in San Jose around 1:50 a.m. Wednesday is puzzling, according to the California Highway Patrol. Sources told NBC Bay Area that the woman's baby is still alive, but in critical condition. Officials, however, remained tight-lipped about the condition of the newborn due to privacy issues. There's not much shoulder room along the road and it's certainly not space enough for two vehicles at once. But that's what happened when a 1998 Honda Civic veered off the road and hit the rear end of a parked and occupied 2002 BMW 745i, investigators say. The three people involved in the collision reported minor injuries initially. 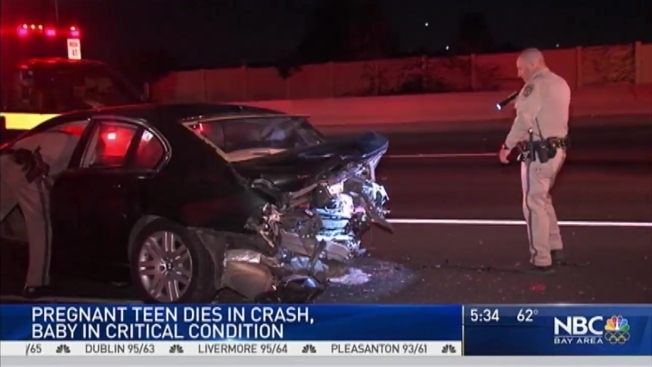 The woman said her leg hurt and was taken to Santa Clara Valley Medical Center while the Honda Civic's 22-year-old male driver and the man seated inside the BMW were taken to Regional Medical Center of San Jose. But things changes rapidly after the woman was taken away. "There were further internal injuries and she succumbed to those injuries this morning," CHP officer Ross Lee said. Doctors found the 18-year-old woman, who CHP officers first said was "presumed" pregnant, had suffered traumatic injuries to her torso. The name of the woman, a San Jose resident, is not yet being released. She died at 5:30 a.m. in the hospital's operating room. When asked if her pregnancy was a factor in the teenager's death, Lee replied: "I am not sure." Hung Tran, the 22-year-old San Jose resident driving the BMW, suffered moderate injuries. He was intoxicated and arrested on suspicion of driving under the influence, Lee said. CHP officials said the driver of the Honda, a San Jose resident, was not suspected of being under the influence of drugs or alcohol. "We will wait for any available medical or toxicology reports," Lee said. Both cars sustained major damage. The CHP says is also examining the BMW to see if it had any mechanical problems. The medical examiner says it will not release any more information until the woman's family has been notified.